Arkansas School Counselors Association supports school counselors’ efforts to help students focus on academic, personal/social and career development. ArSCA has six regions including Central, North-central, Northeast, Northwest, Southeast, and Southwest. 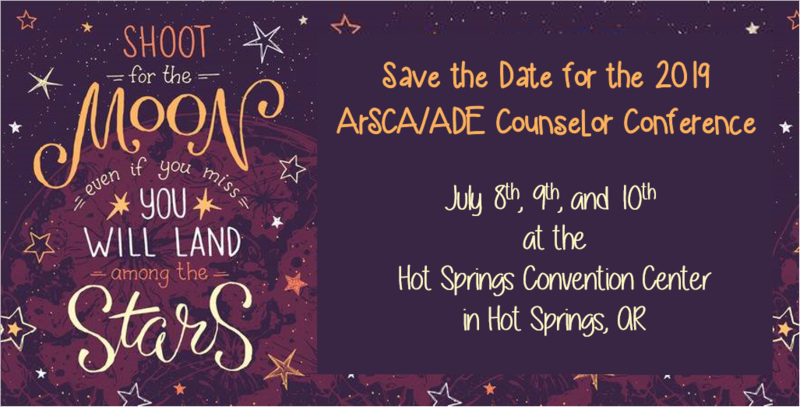 ArSCA empowers professional school counselors with the knowledge, skills, connections, and resources to promote student success in the school, the home, the community and the world. The mission of ArSCA is to represent professional school counselors and to promote professionalism and ethical practices. ArSCA’s goals are aligned with the goals of ASCA. Professional development opportunities in areas to critical need are made available to all professional school counselors. Timely, relevant information exists to enhance professional school counselors’ level of skill and professionalism. Legislative policy exists that supports professional school counselors and child advocacy. Professional and ethical standards articulate the code of conduct and professional behavior for professional school counselors. Strategic partnerships with stakeholders exist to benefit professional school counselors and their students. Organizational structure and administrative functions that facilitate the accomplishment of the goals and objectives.